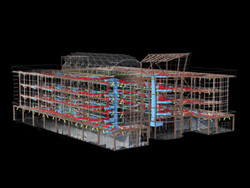 Here’s the important straight-forward facts about BIM (Building Information Modeling), Autodesk, and Synergis Engineering Design Solutions. First, BIM is not only for Architects or designing buildings, BIM is a modeling concept, and it’s what our instructors teach at Synergis 365 days a year. Rearranging the acronym BIM, here’s my shortest explanation of the method. Using Autodesk’s intelligent software packages and suites, create or BUILD a MODEL. From this intelligent MODEL, we can gather INFORMATION such as: reports, analysis, documentation, and many more. Furthermore, the capabilities of exchanging these 3D models between other software packages is priceless. As anything in life, there’s a balance to power and knowledge, and the same holds true for engineering software. On one side of the scale sits the classic AutoCAD approach, and the other side sits the elite modeling BIM concept. Let’s explore the pros and cons. Users are comfortable with this process. Currently, it gets the job done. The drafting time is limited by the software’s ability (aka, drafting speed will never increase). Limited on the file exchange between software packages (aka, the ability to interact with extended tools and capabilities is not available). Limited on the intelligent documenting and reporting. (aka, the drafting department needs to add each and every label using static text with AutoCAD). Example: Designing a gravity flow pipe. In a classic drafting program, a line would be draft representing the pipe. Next, inverts on the pipe ends would be calculated according to the surrounding objects. Third, mathematical interpolation would be calculated for each intersecting object and crossing pipe. If all interferences and slopes work within design specs, the designer can move to the next step. Finally, we could add the static labels. Now, if anything changes, we start this process again, and remember to update all the labels and have a checking process in place for human error and typos. Now, that same process in a BIM application, start the pipe creation tool. Click on the screen to place the pipe. All the labeling, inverts, slopes. . . appear on the screen. Next run the interference check tool to recognize any clashes. If any clashes do appear, modify the pipe using it’s grips, labels update automatically (no human error), then rerun the interference check. Classic drafting programs are straight forward: a line is a line, no extra parameters, no need to learn something new. But understanding that this process leads to human error, manually placed text, manually calculating slopes and inverts, making sure you don’t have any errors when you type up your notes, etc. BIM software automates and animates everything: pipes draw themselves correctly, labels are added automatically and update automatically, clash detection finds all interferences. So sure, this sounds like a no brainer, BIM all the way. When considering BIM remember the benefits and gains are huge. However, keep in mind, BIM is a learning curve and a change of perspective. Now, there’s an object for every part. Each object has slightly different parameters and settings that differ a bit. However, for our customers that are implementing BIM, they are seeing the benefits paying off like less time in designing, less material waste, better designs for stakeholder buy-in, and less costs in construction. So to move forward, who plays what role? First, Autodesk continues to produce world class engineering and entertainment software to meet every user’s needs. Second, Synergis invests huge amounts of resources into understanding these Autodesk packages to create extensive training and implementation plans to help you take your design to the leading edge of compeition. Understand that BIM is the future of drafting/design software packages. Let Synergis help your company minimize these challenges, because that’s what we do as professionals every day. Please refer to “Turn it Up! How to get the most from your training…” by Bill McKown, to get a better understanding of how to get the biggest return on your investment when it comes to training. Also reference “Got Templates?” by Jim Law, for a greater understanding of the setup of templates before any drafting starts. Jesse Evans specializes in Infrastructure (Civil/GIS) as a Synergis Solutions Engineer, and brings a spectrum of industry experience with him to Synergis. After returning to school and obtaining his Associates Degree in Architectural Design, Jesse was employed by a consulting engineering firm as a Technical Civil Engineering Designer. As a Civil Designer, he developed skills in Civil 3D, Land Desktop Development (LDT), Map 3D, Raster Design, and Survey. He has worked on many different levels of land development and survey projects, from hospitals to highways, rivers to residential, schools to subdivisions. With over 10 years of experience using Autodesk Products, Jesse considers learning the best way to build confidence and a brighter future. He firmly believes that understanding the Autodesk solutions can help anybody produce faster, have greater precision, and be more valuable on the market.